RHT PEX Tubing is made in America using the most environmentally friendly method of PEX tubing production - electron beam processing in a "cold" cross-linking process (below the crystal melting temperature). This fully meets today's strict ASTM F 876, 877 and NSF 14/61 standards for PEX radiant tubing, and is also certified for use with potable water. 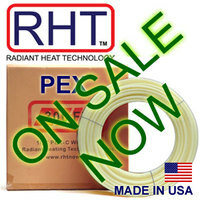 RHT Radiant PEX is produced with a strong Oxygen-Barrier and can be used with either ferrous or non ferrous systems. Crimp Tool, Crimp Rings and Crimp Fittings. Ratchet Clamp Tool, Stainless Steel Cinch Clamps, Crimp Fittings. Press Tool, St. Steel Press Sleeves and Press Fittings.